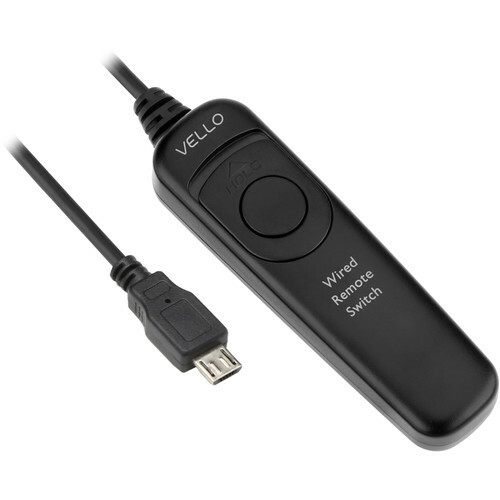 Whether you are shooting in the studio or outdoors, the Vello RS-F1II Wired Remote Switch provides photographers using select Fujifilm cameras with a micro-USB connection with a simple way to control exposures and an easy-to-use tool to create more "keepers". The device is larger and more comfortable to use than many other remote devices, with a thick, sturdy cord. The RS-F1II is compatible with autofocusing, continuous shooting or single image capture, and long exposures. It will autofocus on a half press of the button and trigger the shutter with a full press. Also, users can press the button and slide it forward to lock it for long exposures. Since you can trigger exposures without touching the camera, you will capture sharp, blur-free images. Additionally, the unit does not require batteries as it draws its power from the camera, making it an extremely useful tool to keep in your studio or gear bag. Box Dimensions (LxWxH) 6.8 x 5.5 x 2.3"